I won’t show you any video I made for my day job, because needless to say, that’s stictly between them and myself. Last week, I was given the files to make a video and it had to be in by the end of the month. Then, later down the line, with three days before the deadline, I was given even more files to finish the job off. Needless to say, as it was for the day job, I put aside some time and I got on with it. I finished it with a few days of the deadline and they were very happy with it. So why am I telling you this? 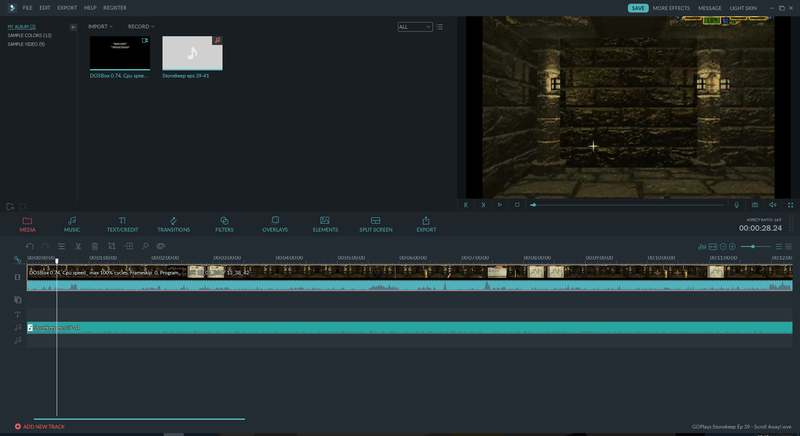 If video editing is something you’re interested in, it’s possible to finish a video relatively quickly, however, the process behind it isn’t that fast. When I said I put aside some time, it was the better part of a week of having less time doing everything else that I wanted to do. Video editing, when you have a clear direction and the files you need, can be as simple as doing some snips, transitions, audio tweaks and away you go. If you’re given low, or bad quality files, you may be in with a spot of difficulty. Part of the problem, at least for me when I first got into video editing, was finding good software that wouldn’t break the bank. Admittedly, when I first started making videos, I used free Linux based software called Kdenlive. It was great for the purposes of making a quick and easy video, but anything more advanced than something quick and easy just wasn’t viable. I needed something with more power and more features, which is what drove me to finally getting an editor that I pay for. Filmora by Wondershare is a wonderful little video editor that doesn’t cost all that much for a yearly package. It’s also not too badly priced for the one-off fee to use it forever. However, you can use it for free to give it a try, but you will have a big old watermark keeping your content covered up so, there’s that. However, considering the prices of the yearly or lifetime packages, if you find that you gel with the software, then paying the price really is worth it. I’ve been using it for a couple of years now and it produces some fantastic results. Filmora can also automatically upload your content to YouTube, if you’re looking to be come a YouTuber. Once you finish your video, you can Export directly to YouTube as opposed to saving a film on your own hard drive. Naturally I’d recommend that you do save your own videos, as you never know how vital those will be to you later down the line. All in all, Filmora has a lot of powerful features, but at an incredibly reasonable price. Windows Movie Maker – A classic, but it is discontinued. VideoPad Editor – Cross-platform, great features. Kdenlive – I mentioned this briefly earlier. I used to use this all the time. I’ve come to move on to Filmora, which is a great bit of software, but if you need budget, Kdenlive is, to me, the king of the free video editors. Works on Windows, OSX and Linux. Blender – Similar to Kdenlive, this is completely free and is fully compatible to work on Windows, OSX and Linux. I’ve not tried it myself for video editing, but I’ve used it for the 3D modelling aspect. An older video I edited. I still enjoy the end result of this one! … Uhh, is now an inappropriate time to say I’d totally take commissions? Just sayin’. Drop Timlah a message on our Contact Us page! This entry was posted on February 1, 2019 by Timlah. It was filed under Technology and was tagged with Blender, commission, Filmora, kdenlive, Professional, Video Editing, VideoPad, Windows Movie Maker.